The holiday season is upon us and the boys and I are decorating up a storm! 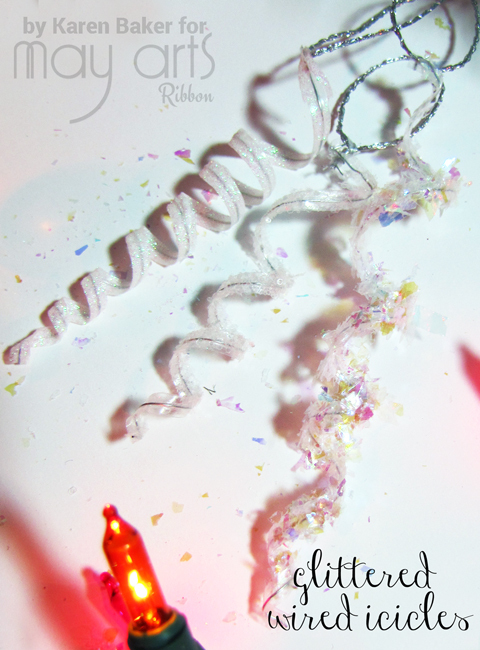 Today and tomorrow, the May Arts Ribbon Blog is hosting a Holiday Kids Crafts Blog Hop, where you can find a ton of cute ideas to make with or for the little ones! The boys and I made some really elegant and super easy Glittered Wired Icicles featuring May Arts Wired Twist Tie Ribbon. I really like the idea of using my May Arts utilitarian ribbon stash for other fun stuff! 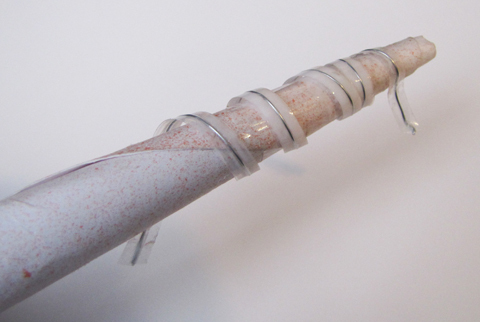 We started by running a length of the May Arts 3/16" metallic twist tie in clear (GF-216-01) through some white, washable, non-toxic school glue, wiping off the excess between our fingers. This particular product is normally used to adhere the loops of bows together or to tie a bow onto a package, but I took advantage of the unlimited length of the twist tie! The boys loved this part, getting all gooey and sticky on purpose! 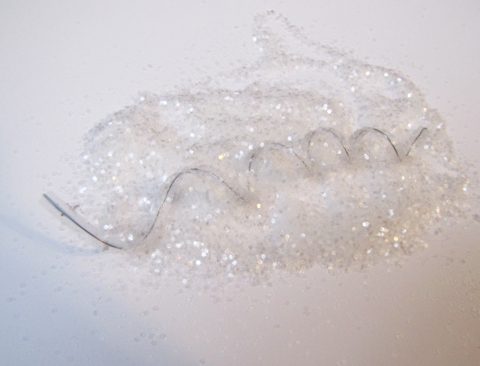 Then we wrapped the glue soaked wire around a small cone and pulled the wire apart, creating our spiraled icicle shapes. You could also wrap the wire around fingers too, watching carefully that it isn't wrapped too tight! Finally, we coated our icicles in various glitter (microfine, regular and extra chunky) and added a tie using May Arts Wired Colored Ribbon in Metallic Silver (KS-31) after the glue and glitter was nice and dry. 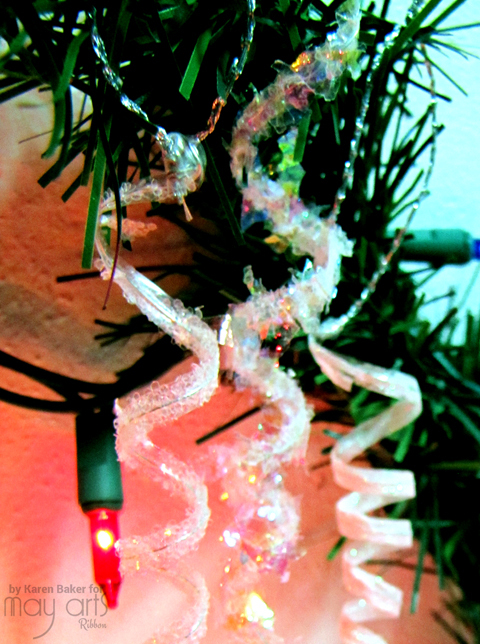 These icicles are gorgeous and sparkly when hung next to a Christmas light bulb! As usual, May Arts is offering up some fabulous prizes for this hop! Head on over to the May Arts Blog for complete details and hop stops! 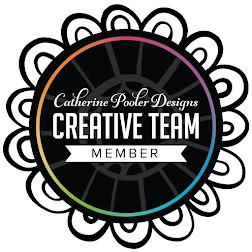 All this week, May Arts has teamed up with Core'dinations for one fabulous blog hop! There is fun, inspiration and prizes! 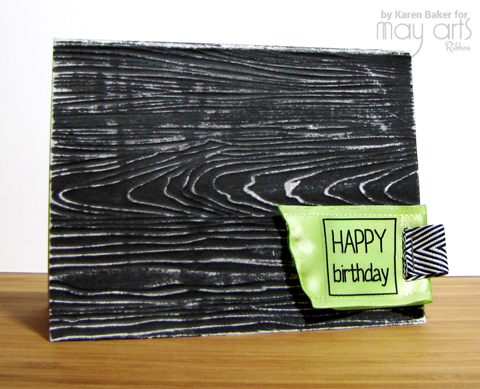 I chose to work with the fabulous Chalk Core A2 Cards. I love the fact that these cards have a black base, but a white core. And...the inside of the card is white so it is perfect for a handwritten greeting. The above card features a wood grain and a few snippets of May Arts ribbon in the form of tabs along with a sticker greeting. Perfect for a guy! (Satin Grosgrain Edge in light green HN-18, and Twill Strips in Black 382-34-10). This next card features some white embossed dots, along with a Core'dinations tag with a sticker greeting, some bling and a gorgeous bow from May Arts Sheer Silk Ribbon in Silver (C31). And lastly, a clean and simple engagement, wedding or anniversary card featuring the classic Tiffany Blue (SK94)! I love silk ribbon and so happy that May Arts carries this color in their silk line. Here's the hop order, and stop by the May Arts Blog for hop details and prize information!! 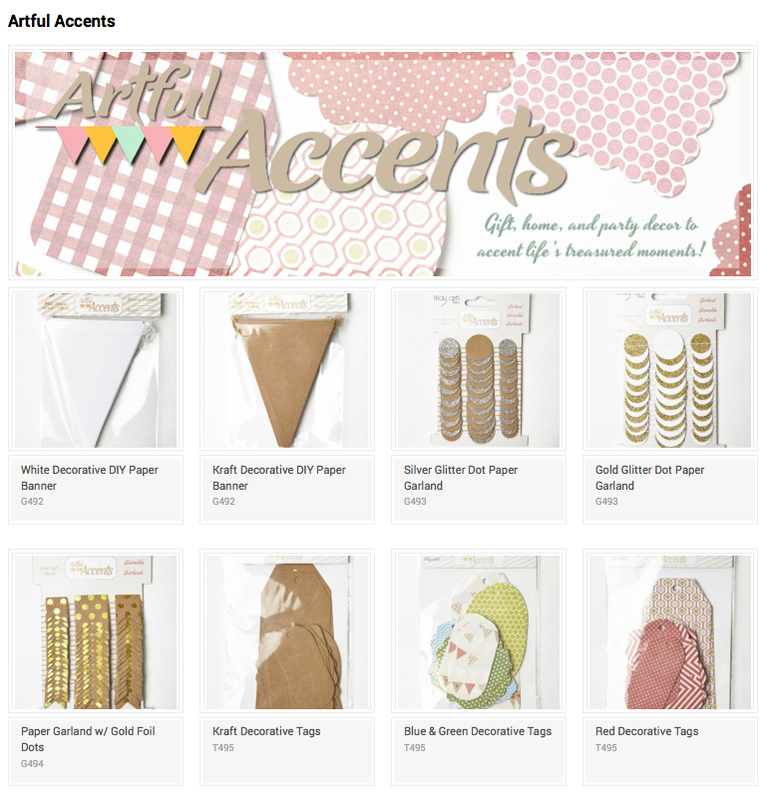 May Arts has expanded their product line to include accents, Artful Accents! 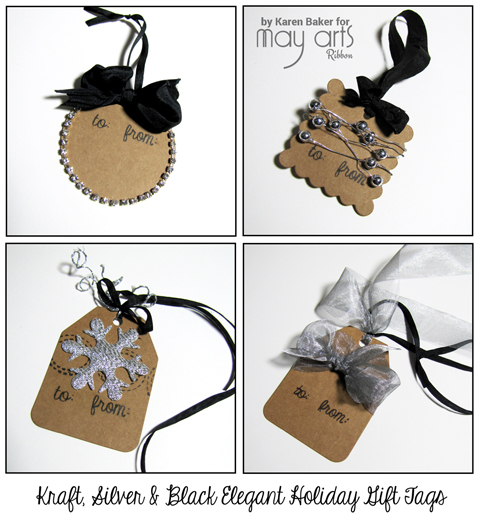 I made a set of gift tags using May Arts ribbon and trims, along with the Artful Accents Kraft Tags. Look at all the amazing new products from this line! 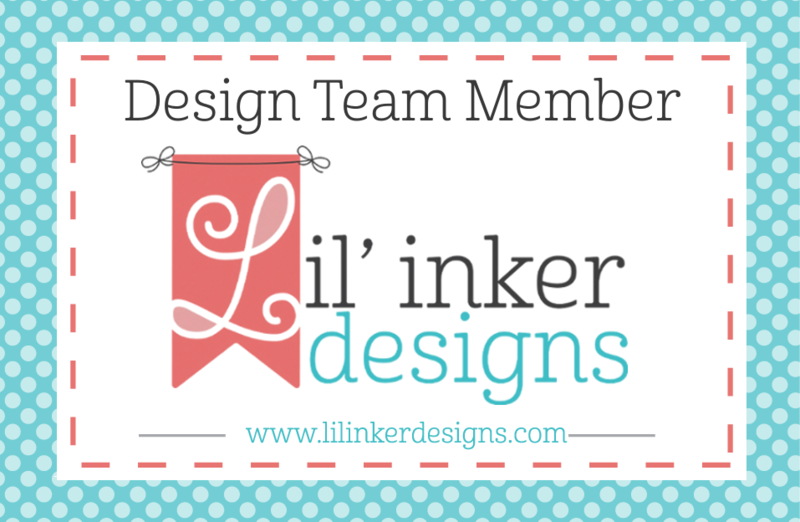 The May Arts Blog is featuring projects made from this line and of course, there is a giveaway involved! Stop on over and leave a comment for your chance to win one choice of one Artful Accent!